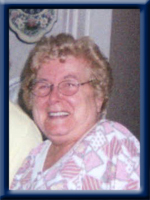 Farcey, Marie Estella, 86, of Brooklyn, Queens County, passed away on Tuesday, July 16th, 2013, in the South Shore Regional Hospital, Bridgewater. Born in Cambridge, Massachusetts, she was a daughter of the late Irving and Gwendolyn (Harrington) Gardner. She is survived by a son Richard (Connie) Cook, of Cole Harbor; stepson David (France), of Ottawa Ontario; grandchildren Jason, Ashley, Justin, Chelsea; great-grandson Cohen. She was predeceased by her husband Allen; stepsons Shawn and Michael. To the family; our deepest sympathy please accept our condolences. Marie will be missed at the Bingo hall she was always a pleasure to see and talk to. We have been saddened to hear of Marie’s passing. She always made it a point to attended our bingo’s, other fund raising events, and supported us in any way she could. Her laugh and friendliness shall be missed. Our sympathies go to all the family. she treated me as her daughter and now she is with her beloved husband.they are side by side in heaven now.R.I.P. MY DEAR FRIEND. The ladies auxiliary br 38 Liverpool legion extend our condolences to maries family, she will be missed. To Marie’s family……So sorry to hear that Marie has passed away. I enjoyed playing cards with Marie at the Brooklyn Marina over the years. She was always a lot of fun. Thinking of you all with Deepest Sympathy. So Sad to hear of Marie’s passing. What a sweet lady she was, always had a smile & quick to laugh. May God give you all the comfort you need to get through this valley. We were sadden to hear of Marie’s passing. Sending our sincere condolences to all of the family during this difficult time. Marie was a lovely lady and will be greatly missed. So sorry to hear of Marie’s passing. She was a lovely lady. We use to bowl with Marie and she was always a lot of fun. Our prayers are with you all.